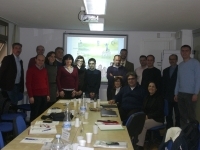 Within the framework of the European project [email protected], the working group coordinated by INFOREF (made up of several actors of education in the Fédération Wallonie-Bruxelles: teachers, educators, school mediators, headmasters, youth aid services, psychologists, services of the Ministry of Education …), has developed a product for teachers in order to help them identify and prevent behaviours and situations that can lead to early school leaving. The “Cube” is an educational tool to prompt reflexion, foster discussions and the search for solutions on the topic of early school leaving. 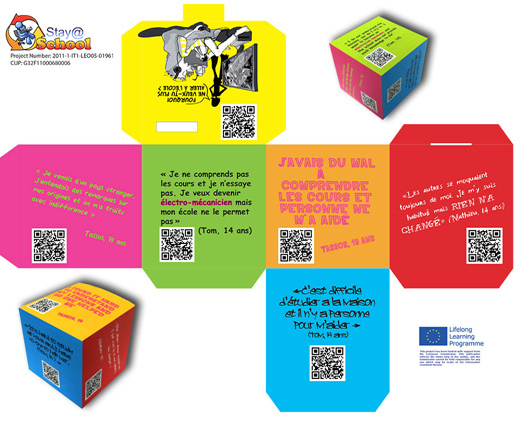 Each of the six sides is dedicated to a factor of early school leaving and displays a testimony of a student (or an image) along with a QR code linked to a specific video. The video proposes a reply to the evoked situation: a positive message to identify oneself and search a solution. The tool comes with guidelines. This document details the objectives of the cube and gives ideas for use. The tool is addressed to teachers but can also be used by other members of the educational team (educators, psychologists, mediators…). It could also be used by anyone concerned by education (parents, future teachers, youth associations…). The tool was imagined for secondary school students, but the working group made it so it can be adapted, for instance for primary school pupils. Those categories are not mentioned or visible on the cube. They are only used as support for the teachers and are illustrated by the sides. The first thing that catches attention is a sentence or an image evoking a cause of early school leaving. Thus the students can identify by themselves the risk factor illustrated on each side and think about the problem. The quotes are real testimonies of students who dropped out (collected during previous projects). The creators also provided for the possibility to insert anonymous notes or ideas in the cube, through an opening. Those comments can be used for future activities or to involve students who would rather not speak up. The students’ reactions and the discussions that will have emerged will help the teacher identify students at risk more easily, for instance when a student identify themselves with a situation. The tool was developed in June 2013. It was positively welcomed. Around fifty cubes have been tested in September 2013 during welcome days in lower secondary school. The tool is adjustable and available in English. It is available for free on the website of INFOREF. The creators wanted the cube to be adapted by any user. Thus, the user can search other videos in their national language and create a QR code out of them. The testimonies can also be adapted according to their school context.